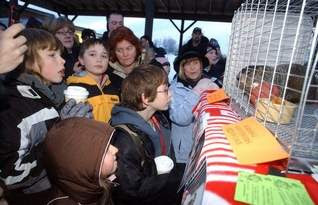 This morning at precisely 7:41 a.m. Buckeye Chuck made his prediction while a crowd, estimated by the Marion Star News to number 150 frigged spectators, looked on. Although it was overcast, the "official" pronouncement was that he had indeed seen his shadow. Thus he has betrayed those seeking an early spring by forcing us into dealing with six more weeks of winter misery. After Church on Sunday I drove down to be present for this event. The actual viewing of Buckeye Chucks appearance was not my primary purpose. Following that disappointing event a group of letterboxers gathered for a mini-meet. In the end I don't think it was that small as 14 registered attendees made it including the spouse and two young men of our hostesses, "Songwriter's", household. Her son "Whiz Kid" is among those pictured here. She had tons of great food, which went largely ignored, as we stamped, stamped, and stamped some more. Soon it was past noon and time to diverge. So with reluctant goodbyes we separated until the next time. I met many new faces as most of those present are from nearby areas and I am not. After the event I looked for some local drive-by boxes but the snow cover kept me from being able to access any of them. Nevertheless, it was great fun and I will try to return next year. I also stopped in nearby Waldo Ohio to sample the famous "Bologna Sandwich" at G&R's tavern, it was very tasty. I am told that they have the bologna that they use specially made. It is late so I will stay here tonight, drive back home tomorrow, and then begin to sort out all of my new stamps.